JPY is pressured by the positive impact of the leading stock exchanges derived from the “risk appetite” growth. 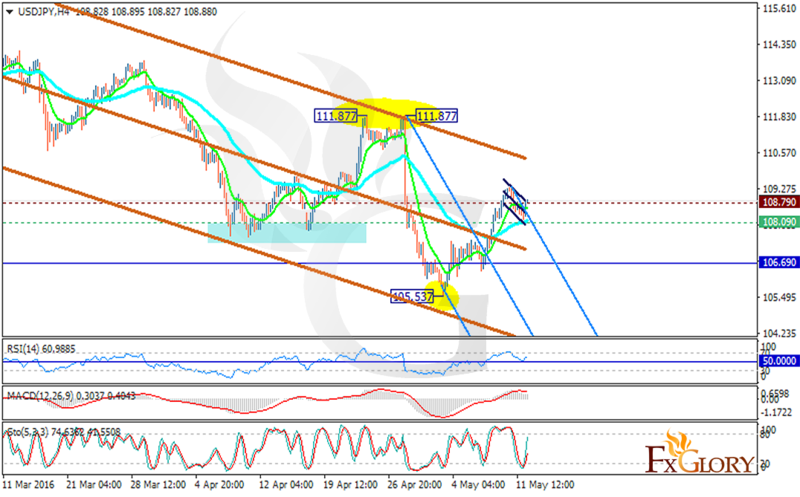 On Wednesday USDJPY moved with bearish bias but today it showed some strength and pushed itself up. The support rests at 108.090 with resistance at 108.790 which both lines are above the weekly pivot point at 106.690. The price is testing the resistance level at the moment which will probably push it higher. The pair is falling down descendant channels, both long term and short term, within the Andrews’ pitchfork. However all indicators are showing bulls’ return at any time. The MACD indicator is in positive territory, the RSI is above the 50 level and the stochastic is showing higher price actions. The EMA of 10 is also above the EMA of 50 suggesting the price growth over the last recent days. Even if the resistance level is broken the price will not rally above 109. It can also break the support level and go lower. Traders can stay aside a while to let the chart show more accurate signs.